This afternoon, Danny came back from his morning time with Little Bean, bags of groceries and produce from the farmstand in his arms, a smile on his face. “Did you have a good time with Daddy?” I asked her, scooping her up in my arms for a hug. She nodded  her big, emphatic nod  eyes wide, already starting to babble. I covered her cheeks in kisses, making her giggle, then put her down so she could explore some more. Danny and I started unloading the bags. 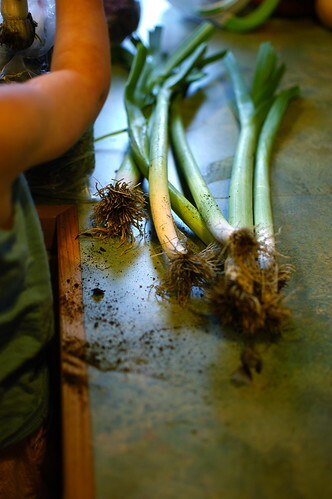 “What did you two do?” I asked him, pulling out a fistful of fresh leeks, the dirt from the roots falling into the sink. We’re lucky here. There are at least a handful of farms on the island who grow produce all through the winter and leave the latest crop out in their stands. No one ever mans the tiny shacks or lean-to buildings. There’s just a piece of paper and pen, a rusting scale, and a coffee can. We grab a bunch of Russian kale or a pound of shallots, write down our purchase, and shove our money in the can. Danny told me about his time with Little Bean, while she stood at the couch with an open Beatrix Potter book, babbling to the pages, pretending to read. Danny was chopping the fresh leeks as he told me this. I could smell the faint onion odor from them, mild, just a bit of a bite, not like the jagged tastes in the mouth that onions give. He was cooking pasta and blanching broccoli, rendering bacon and grating the Parmesan. We sat down with Little Bean, her feet dangling in her chair, and shared this dish for lunch. We don’t doubt it’s true, however. I don’t want to say anything definitive here, or declare how this happened. I don’t know. All I can say is that we are happy that our daughter is exuberant when walking with her dad into a farmstand down the road. And that she already knows the feeling of fresh leeks underneath her hands. And you? How have you introduced your kids to food? Or how were you introduced to food? At the very least, how do you like your leeks? My mom always made vegetables part of my life. One of my earliest memories was of her standing at the stove making chicken cacciatore with tomatoes we grew in the backyard. We lived in a bad area at the time, but my mom always made sure our food was real and wholesome. I will always be thankful to her for that. Now as an adult, I can see how her piont of view shaped my eating habits today. By the way, that pasta sounds delicious! I was brought up to eat everything. It helped that my dad was a farmer, so there was always plenty of fresh vegetables. But to this day, I always finish my plate and eat anything and everything I'm given. Leeks are always in our fridge. We love them in stews, fried off first though of course. Or fried and added to a potato bake. Yummy! Beautiful post. I don't have children yet, but when I do, it is a major goal of mine for them understand where food comes from and really appreciate it. I don't know where I learned to appreciate food and its source. I think the latter part has only come recently, once I fell in love seeing and tasting real FRESH food as I strolled through a farmer's market for the first time. As for leeks? I put them in everything, often to replace onions when I want something a little more mild. Love them in combination with mushrooms and poultry and in risottos, and of course I love to use them in soups as well. Jamie being in tears as you said has been reported here are well, with pictures. I, for one, can quite believe it. I know that you are fans of his, but you may not know that he has done this kind of exercise in the North of England, in a town hard hit by unemployment, and found a similar lack of knowledge of veg and cooking in general. His idea was to set up cooking classes, where friends and neighbours would teach each other, and I believe the council-funded spaces for doing this still exist, a few years on. He is, of course, to use the popular phrase, one of our national treasures, but we all believe in him totally. Do you know about his teaching restaurants, in which he takes disadvantaged young people, even with criminal histories, and turns them into chefs (they do have to behave, mind!)? I do envy you your access to such produce on your island – Lucy is a very lucky little girl. I don't have children yet. But when I do, I feel that one of the most important things I can teach them is the value of REAL food. Little Bean is a lucky girl! When I was growing up, we had little choice but to eat fresh foods. When my own children came along, our meals were made up of mostly unprocessed foods. As for leeks, I love using it in sauteed buttered, veggies. I love having my kids see where their food comes from. In fact, I wrote about that very subject today on my blog, too–our food shed's a little different, but same idea. Garden, garden, garden! I was raised with a huge garden and I'm raising my kids with one. Growing vegetables is not romantic—it's work, GOOD work. Work that overwhelms and inspires and exhausts. My mother and I dedicated a whole chapter to this concept in our book (that never got all the way finished). Our boys love the farm and the farmer's market. My 3 year old asks for broccoli and bell peppers. He loves the squash with grass-fed butter we eat a few times per week in the winter. Our 1 year old turns his nose up at anything not homemade. It's so neat to watch because it is the opposite of what I knew of food as a child. They know that milk comes from a cow they've met in person, not a grocery store. They know that vegetables come from the soil because they've planted and harvested their own from our garden. My 3 year old often asks "where's grass-fed beef?" He's learning about food exactly like my grand parents would have and I am so thankful to see a return to real food. Oh goodness, this just makes me want to fly over there, scoop up Lu, and hug her like crazy. A kiddo that loves chard? She needs to teach my fiance to love it… We always had a garden growing up, and got to plant our own row's worth of different veggies (or horseradish, in my sister's case – we're still stuck with that one). As for leeks, I love them in quiche or risotto especially. I grew up in Paris but we would go to my grand-mother's house in the country for most of our time-off. She grew her own vegetables… We would also go to the farmer's market with my dad on Saturdays… and when I think about it now, it has had a major impact on how I eat vegetables and appreciate the local-full-of-flavor fresh produces. I believe in introducing fresh vegetable/fruits to children as soon as they are able to digest them so that they develop a taste for them. I also have this theory that children eat-by-example. Your story about your daughter and chard is a good evidence of this theory! If children see adults cooking and eating together, chances are they'll be good eater. It does not have too be fancy… but it has to be from scratch (as much as possible). And yes, I also strongly believe that snacks should be limited to very small quantities of healthy food and should be far enough from meal times… It's OK to be hungry when sitting at the table for lunch/dinner!! PS: Leeks? Young ones: cold with a sauce vinaigrette; bigger ones: sauteed with fish/pasta/rice… and the green parts in soup! I just can't understand why they are so expensive in the US! Any idea? I don't believe I've ever tried to eat a leak before. But I did grow up on a farm. I failed miserably to grow my own veggie patches. I had to help shell millions and millions of peas. I had a dog addicted to mulberries and green peppers (she would pull them off the plants.) I would go egg hunting in the chicken coop and I drank my milk freshly squeezed from the cows. How sad that our children have no idea what fresh veggies are! My daughter tells me, weekly, that so and so asked if I would pack their lunch as well…….their family doesn't buy fresh produce for them at home. Heartbreaking! Our daughter loves to proudly show her home grown foods, she also loves so many farmers at our local market…..we always list whose farm our meals come from during dinner. So many questions! First, my favorite way to eat leeks is a simple saute. Butter, salt, leeks…that's it. I grew up in the country so we grew a lot of our own food. It was WI so obviously in the winter we bought our produce but it was never in a can. And my parents are former dairy farmers…so we always knew where the meat came from. As for my son, we are currently city-dwellers but a few years ago I put in a tiny garden. He loves growing his own produce (we also have a lemon and orange tree). And one of our favorite things to do is go to the farmers' markets…many times I find toothpick in the washing machine from his pockets – he loves to sample everything! Oh how I love this post!!! I love that my kids get fruits and vegetables. I love that we live too far away from a McDonalds to ever have it be a inexpensive solution to our meal plans. I love that when I offered my kids ramen for the first time the other day that they actually didn't like it and wouldn't eat it. Yeah for good, real food!!!! I'm most surprised when I have to tell the checker at the grocery store what an item is so he can look up the code. We love taking our kids out our CSA, but we live in the midwest so during the winter it's back to the grocer. I actually just started using leeks this past winter… I had never been introduced to them before and discovered they are a great substitute for onions (which my husband is allergic to). So I can now have Onion (substitute) in my food again!!! I made a pico de gallo that turned out wonderfully and posole with carnitas seared with leeks. I have had quite a time! I am now using leeks in almost every dish trying to catch up on all the flavor I missed out on these past 10 years. The crunch of a fresh bit of leek is just amazingly tangy and great in a salad or in top of my burgers. When my son was just under 2, he was walking with me at the supermarket, and the red peppers were down on the lowest shelf in the organic section. He leaned over and took a huge bite out of one! Sadly, his favorite food in the world at age 4 is mac 'n cheese, but he'll still grab a pepper, or cucumber, or celery straight from the market and chomp away. We grow vegetables in our garden each summer, and the kids will eat nearly anything grown in our yard. Cruncy snow peas, shelling peas, tomatoes, ground cherries… We go to the Farmer's Market and they get to pick apples and tomatoes and squashes of all colors. As for leeks, I've just this past summer fallen for them. We got "bunching leeks" in our CSA box all the time. They're so easy to clean and use, and were just extraordinary! A Basque friend taught me how to make their version of leek soup, called Porrusalda. So simple — the only requirements are good vegetables and a whole lot of slow-simmering time — but such a great flavor in the end. I've never posted here, but this moves me to be part of the conversation. As a new homeowner who is finally moving out of pot-gardening this year (!! ), I am so excited for my own harvest and mourning for kids who never got to have what I had as a child: fresh stuff from the ground! Watching plants bloom! My grandparents' garden was one of the most remarkable places to visit when I was a kiddo– you had to inch up a dark, narrow space behind the garage, up a craggy, stony path so it felt like an adventure just to get there. And then the bounty of an Italian garden– no one can come close to those tomatoes! But it was just part of what we knew as 'dinner.' I cannot imagine being without fresh produce and I am glad there are parents out there who hold the value of fresh, beautiful, healthy food out as an important one to their kids. We're leek addicts and lately have been doing a leek and cabbage saute– olive oil or butter, leek first, then cabbage, s/p, and if we are feeling less-than-virtuous– a little glug of half and half or cream at the end. Mmmm. While I don't have any kids of my own, over the summer I babysat a little girl and one of our weekly outings before going to the beach was to the farmers market. She already adored vegetables but she really liked seeing the farmers and all the samples. My eastern european grandfather lived with us when I was a child and he was the one who taught me about food. He cooked everything from scratch and we always had a garden and fruit trees – we even had chickens for fresh eggs. All in suburban silicon valley. He taught me how to pick ripe produce and what it should taste like. And of course all the loving memories of eating together. That history is a huge part of who I am. Food and eating are so elemental, truly experiencing and understanding that creates a rich foundation for life… I'm so glad there are more and more people coming to realize that and want it for themselves and their families. Knowing where their food comes from is something we value greatly for our children (and ourselves). We feel very good about our choice to live in Portland, OR for this reason. Local food seems to be a part of the pervasive culture in this region. We're slowly adding more garden space and reducing yard and decorative plants, which I love and makes me feel slightly subversive! Teaching her about real food and having her eat good stuff (veggies!!) from an early age is SO important. I love to read about your foodie family and the way life with food is supposed to be. Wholesome, fresh and enjoyed. Thanks for the reminder Shauna! Growing up in Wales, we'd head down to the market or out to the farmer's house and pick up fresh veg a couple of times a week. Once we moved to the US, not so much. Grocery store or starve in many places, especially where we lived. Now that my wife and I live in Atlanta, it's much easier to get a hold of fresh farmed veg and to actually know the farmer, as many come into town a couple of times a week. As for my leeks, I'm very partial to leek and potato soup. And braised leeks in bacon fat is delicious. My kids are constantly telling me stories of their friends who have never tried and sometimes don't even know what… mangoes…artichokes…cranberries…peaches…countless other vegies are. And have not idea where eggs, milk, cheese, chicken comes from. They're also great in seafood risotto when you just want a hint of onion in the background to flavor the rice, but not get in the way of the seafood. That makes me very sad about jamie oliver. I grew up in a big city (birmingham, UK) but my parents had an allotment and we ate tons of fruit and veg from it and helped out in exchange for our pocket money. I wasnt very grateful then, but I am now! i grew up on a farm and we ate everything. my dad pulled turnips out of the ground, pulled out his pocket knife, sliced it and ate it. my husband is picky picky picky and will not eat a lot and i have given up a lot of vegetables i grew up on. i wish i hadn't especially for my kids! LOVE that your baby knows food and fresh veggies!! somedays i crave lima beans and brussel sprouts! Wow, I saw that post on Facebook too and felt true fear for the health of that community. If a child doesn't understand the difference between tomatoes and potatoes, they will have lots of difficulties with their diet throughout life. Food introduction was simple for my twins. When they were born, I was running the organic food buying club for my medical school. I would go to the local distributor of organics and purchase cases to share with fellow classmates. My girls grew up helping me do this as well as putting in our home garden. Get the kids in the dirt is the best way to let them discover all the wonderful foods out there. My girls adore chard as well. They have never minded being the kids with the "weird food" in their lunchbox. Can I tell you how proud I am that they were incredibly excited to see Food Inc (the movie) and Michael Pollan in person recently? They even got to thank Michael for sharing his amazing work concerning the health of our food system. He was gracious enough to complement them on their hats. I know I have little to worry about with my kids, my focus is on those children who don't get to learn like this. My mom and dad were always very firm about making sure we ate our vegetables. In the summer, when we were lucky, that meant farmstand vegetables on the Cape. My love of food involves far more vegetables and less meat than does my mother's more 50s influenced one (I still can't fathom my grandmother's categoric refusal to eat beans!) but I love the creativity that comes with cooking and eating. As to leeks, I love them at breakfast. Rough chopped, sauteed with potatoes and what everyone else feels is too much salt, with a fried egg on top. I don't eat much pork, but crispy bacon would be a delicious addition. My Sicilian grandfather always said that you can't dislike a food if you haven't tasted it. He passed that on to my mother, and she onto my sister and I. We had to try everything, at least once. We were allowed to dislike it, but we were not allowed to not try it. The outcome is that my sister and I love food- real food- and always have. As kids we didn't ask for chips and cookies, we would ask for a plate with fruit and cheese as an after school snack. I think our appreciation for food also sparked our interest in cooking, we love to make homemade meals. My husband and I just had a son (he is 3 months old) and I am so excited to introduce him to food. Because I have Celiac Disease, I plan on keeping him mostly gluten free, so I think that will actually help us avoid the junk food and stick to real, good foods. Your question of how I was introduced to vegetables took me down memory lane. My grandparents raised cattle, and they also had a large vegetable garden. My earliest memory of vegetables is helping dig new potatoes out of the sandy soil of East Texas. While I wasn't introduced to a huge variety of vegetables, I did learn the benefits of buying food directly from the people that grow or make it. My family provided the foundation – explorations in swiss chard and other relatively newly discovered vegetables can continue for the rest of my life! I grew up in Venice, Italy, and my mom would buy produce almost daily from the farmers' market. Everything we ate was in season and grown locally in the island of Sant'Erasmo (except fruit). We ate very little processed food, probably none actually. That's how I am raising my kids, eating healthy, growing few vegetables, raising chickens for eggs, and in season. My son, who is 12, now gets it when he tastes a tomato grown in our garden, and it is a pleasure to see. When I read of Micheal Pollen's latest book on eating rules I started laughing, and then I got speechless thinking that people need a book to teach them that fresh is best, and that a vegetarian diet is healthier. I love leeks roasted in a high oven or in a zucchini and leek quiche. I want to know how you cook leeks. I am being a posting pig but just had to say my kids too, grew up with vegetables. They would wait like sharks around the oven as I baked eggplant parmesan for example and most favorite dishes included vegetables. Their treat was a fruit plate, they loved that fruit plate. Three of her children she acquired by marriage and these kids hardly knew anything about vegetables – now they are learning and loving some of them. As I did with my kids; we have tasting parties and they get introduced to something new…now her own little guy always has been around vegetables -I made a little jack-o-lantern for him once from an enormous orange pepper, he about two. He looked and smiled and immediately took a great big bite! squishing dollars in open glass jars in exchange for fresh eggs, produce, and flowers is the thing i love MOST about life on a small island. it's such a throwback to simpler times and simpler lives…your little one is so lucky to be able to participate. Sadly, I think the reason people are eating so much processed and fast food if because it's cheaper than eating fresh. If you've got say, a family of 5 and you only have $5, you can get each of them a double-cheese burger. If you wanted to serve broccoli and cheese rice, you'd be spending at least $5 for the ingredients, but you can buy a box of Uncle Ben's broccoli and cheese rice for under $2. It's just really sad. I actually don't shop at the farmers market so I don't know about the prices, but in the grocery store, veggies are expensive. I think another reason is that people have such busy schedules. They don't have the time to use fresh ingredients and cook from scratch. I can say that the latter was the case for me. I stay at home now and so I'm able to actually cook from scratch. I have time to plan meals and look for some really good recipes. Half of my groceries are produce now and it's a really good feeling to know that I'm feeding my family healthy meals. Leeks.. I've never eaten them, but I have planned for Leek and Potato soup this week. Just picked leeks from our garden yesterday and made a leek/carrot/ginger soup – fabulous! We have a hobby farm, and are trying to grow most of the veggies we eat as well as experimenting with some GF grains. I am hoping that my kids will grow to appreciate the fresh food – neither of them cares much for fruit or veggies no matter how it is presented! I second the idea that a lot of people eat processed food because it's cheaper. We were very poor when I was a child and consequently I didn't eat near the variety a lot of my friends did. We ate only what my Dad could cook and what was cheapest. I didn't have Chinese food until I was in middle school. This has led to many experiences as an adult where I will try fresh veggies and discover that's not what I thought it was. For instance, I thought I hated green beans but I'd only ever had canned ones. My first fresh green bean was a revelation. Ditto with pineapple and pears (which came from cans in my house). Cooking fresh ingredients often takes slightly more time and slightly more money, both of which are luxuries in a lot of American homes. I was really truly only introduced to food in recent years, in my 20s, when I first became vegetarian, then cut out wheat and eventually dairy from my diet for health-reasons. That is when I began to love to cook and to learn about each and every ingredient that went into preparation. So many grocery store foods have so many different chemicals, additives, and simply are not workable for those of us who can't handle wheat or gluten, or milk, butter, cream, etc… Now I prepare nearly everything I eat from scratch, and shop our local farmer's market when its in season, freezing much of what they grow and what I forage so I have it year round, canning other things, and patiently waiting until spring arrives. I grew up in Russia in the 1980's/early 1990's. At the time, processed foods were not readily available there (with a few exceptions such as sausages), and most families made their meals from scratch, not out of a box or a can. Workplaces frequently had cafeterias, but many people opted to bring their homemade lunches instead because cafeteria food was not very good – and going homemade was cheaper. I lived in a city of 10 million people, we didn't have a garden, and I don't remember ever being explicitly taught about produce – what it looks like before it's cooked, how it's grown, etc. I think it's something that I mostly picked up from watching my mom cook every night, making delicious dishes using potatoes, cabbage, beets, carrots, eggplant, tomatoes, squash, herbs, and other vegetable and non-vegetable ingredients. I think I also picked up some of that knowledge from reading books – again, not books specifically about food, but regular books that happened to mention peasants and farmers and people who cooked. When I was between the ages of 6 and 9, we spent our summers in the Lithuanian countryside, where we picked berries and mushrooms in the woods, bought apples from local villagers, and drank milk that came from a goat minutes before it was poured in our cups. Our landlord also generously allowed us to pick produce from her own plot, and most mornings my sister and I would harvest cucumbers, tomatoes, peas, and occasionally strawberries. It was fun, but I don't remember these experiences being some sort of a revelation for the city girl that I was. In fact, I disliked most fruit and berries back then because I was terrified of the worms that occasionally made their way inside, and I stayed away from mushrooms for a long time after I accidentally almost ate a fried wasp with my fried mushroom and potato dish. So, I think what mostly contributed to my understanding of where food comes from and my willingness to eat almost anything is the fact that everyone around me ate real, made-from-scratch food, and also just a general awareness of the origins of different types of food – awareness that, sadly, seems to be missing among city kids in many industrialized nations. And, now on to leeks: I had them for the first time about a week ago and loved them! I used them in this dish: http://www.thewednesdaychef.com/the_wednesday_chef/2009/12/caminos-egg-baked-in-cream.html. We always had a backyard garden growing up, so I was involved from planting to serving my veggies from a pretty young age. The tradition continues with my own daughter (3), who spends most of winter asking when Grampy will "wake up the garden" in the spring (there are various practical reasons that growing through the winter was given up on in recent years). We also make fairly regular trips in the summer to pick blueberries at a nearby farm and pie pumpkins and squashes at the same place in fall. And then there's the apple orchard we make several trips to every fall. There's a local dairy we visit for eggs and milk and cheese and she's been on the tour a couple of times. I was introduced to leeks much later on in life because they weren't really available when I was growing up. Granted, there were other vegetables in Southeast Asia that I ate as a child – my aunt grew bittergourds in the courtyard and while I loved the flowers I didn't like those bittergourds till I became an adult! It's an acquired taste, I suppose. My mother was the one who first put leeks into a beef stew with lemons and peppercorns somewhere towards my late teens, after I'd gone to university for a while. I got hooked after that! Nowadays a lot of foods -are- processed, even here in the tropics, but there are enough little stalls that cook food on the spot that most people tend to go out and eat instead. Home cooking is definitely more healthy, and vegetables here aren't quite as expensive so I still find that a lot of people prefer to make a quick meal at home than go out to eat. The sad thing is, cooking seems to be a dying art so most people my age opt to go -out- to eat instead! I like my leeks sauteed in a bit of butter, then simmered with crushed tomatoes and cumin-kissed chicken, over rice noodles. So good. I too was brought up to eat vegetables. I don't remember ever not wanting vegetables. My mom tells me stories now of how when I was little, she used to have to bribe me with more vegetables to get me to eat my meat. Somehow, I always wanted more green beans or broccoli instead of steak or chicken. (I spent the first 6 years of my life in Sacramento, and when I visited my grandparents after we moved, my favorite thing was the Farmer's Market). It's still true today. I don't have kids yet, but I hope that they will love their vegetables and fruits as much as I do. And I plan on using the next years before I get married and have kids to learn about vegetables we never ate – leeks, cabbage, the things I didn't learn to cook. i grew up on a farm and we ate everything… my husband is picky picky picky … and i have given up a lot of vegetables i grew up on. i wish i hadn't especially for my kids!" I hope you can find a way to enjoy what YOU enjoy… as well as what's good for your whole family. I know it isn't easy; i've just returned to using walnuts in my baking- I love them, but pretty much abandoned tham for about 20 years for the palates of my family. Know what? they'll eat and enjoy the baking I do with nuts. And I'm wondering how to gently introduce more veggies to a new member of our family. We have a boy now, who recently married my daughter. He grew up with a different lifestyle. But two things I wish: that he and his wife would eat meals together. And that they would enjoy- and he would try, without histrionics- new flavours. If/ when they have kids, will those youngsters be open to new foods? So much easier to close a person than to open them up. Every once-in-a-while I have to explain my purchases to a cashier. For example, one did not know what basil is and another asked me why heirloom tomatoes cost more than "normal" tomatoes and why I would opt to pay more. I was shocked at first, but now I understand that many people don't have access to/knowledge of/interest in healthy foods and I am happy to explain my groceries. Happy eating! We are lucky enough to live north of you in Whatcom County. We have access to the most wonderful farmer's market, Food Co-op, and are in the midst of dozens of CSA's. I vowed when I had children to never feed them the jarred baby food I remember shoveling into my sibling's mouths. I knew that I could never convince them to eat something I could hardly stand to smell. I have made hundreds of containers of baby food in the last 3 years, and both my sons (ages 3 and 10 months) are fabulous eaters. (BTW…the book First Meals by Annabel Karmel is an incredible resource). One of the staple ingredients in their meals is leeks, thanks to their mild but fragrant taste. I love that my 3 year old knows how to eat an artichoke and prefers his veggies to his meat! Of course, I guess the ending way before I got to it. 😉 That's so wonderful. Now I want to come to Vashon Island just to eat in The Chef's restaurant! Watch out … word might spread and Vashon and The Hardware Store might not be as quiet any more. LOL So glad everyone is doing the things they love! I like my leeks made into a mild, flavourful Sweet Potato soup – aired by Chuck on his show on food network – Chuck's Day Off. This soup has a slight hint of ginger. Simply delicious. I'm a big vegetable fan. As a kid, I helped my grandma in the garden and when I was bigger, I had my own little patch with carrots and radishes (they didn't live to grow up, though. I was a very curious kid and would take one out of the earth every day to see how far they had grown.) I'd love to have a garden now, but I moved to a big city for university. When I have kids, I'll try to move to the outskirts and have one, though. There was always a vegetable on my plate growing up and I always had to try it. I think that's why I'm such an adventurous eater now. My fondest food memory is picking cherry tomatoes with my mom in a little kitchen garden behind the beach shack we used to rent every summer in Delaware. We'd fold over the bottom of our t-shirts and pick tomatoes. They tasted amazing! As for leeks, I haven't had much experience with them, but I once used them in a pasta dish with peas and a parmesan sauce. I made it for a dinner party and got rave reviews. I would probably buy them more often but find them hard to clean! Any tips? I grew up with veggies and fruit in the yard every summer and I always grow some stuff at home. The biggest piece for my three kids, though, is that we do a work share on an organic CSA farm every summer. The farmer has become one of our family's friends, not just a picture in a story book. I'm a potato-leek soup fan, personally. ham potato leek soup hands down! I live about 2 hours away from Huntington, WV. I doubt it's the poorest city in the US, first of all. Secondly, I get so sick of people saying that people in WV are stupid! My 3 year old has known what a potato and tomato are for a very long time. I have taught in WV public schools, and I can say that the children I taught knew their veggies pretty well too. We are mostly a rural state, and many families have gardens. We eat organic, natural foods for the most part. My family's diet is very healthy, and I just wanted to say that the whole thing sounds ridiculous in my opinion. Maybe it's an issue of drama for tv! One of our favorite things to do is go to Farmer's Market. I've been taking my kids there for 13 years. It is always an outing. We stroll through the market trying everything that is offered. Our farmers are very generous with their samples. If my kids like anything we buy some. For a while my son, 4 at the time, was in love with eating broccoli flowers! Now my youngest, who happens to be 4 also, is in love with wierd colored veg. Red carrots, purple cauiflower, we buy it all and have so much fun. We are truly blessed to live near so much abundance. This seems like a classic case of 'a knowledgeable rich white man is going to save us poor folks from ourselves!' And it very much reads as sensationalistic. In my experience, growing up in many places in the South, you simply cannot walk into a room, proclaim that your way is the best and expect that to go over well. It doesn't matter if you truly are right; it will not work. Then again, some people like french fries from McDonalds. And that's okay. When I was still transitioning from bottle to solid food, my father would add pureed vegetables (peas, carrots, whatever) and fruits to my formula. He loved to tell a story about dropping me off at the sitter, with the formula ready to go. The sitter would call my parents, very concerned…she thought that my blueberry milk was molding! Once I was older, I was consistently taught to eat and appreciate all kinds of food; to find something to like whether we were at home or the Chinese place…And I was not allowed to go to the Chinese place and order a grilled cheese! Finally, there came the cooking, which was a *basic life skill*. And it wasn't just my Dad. It took my father, mother, grandmothers, family friends, and a heck of a lot of time just lurking in the kitchen, seeing how things are done.